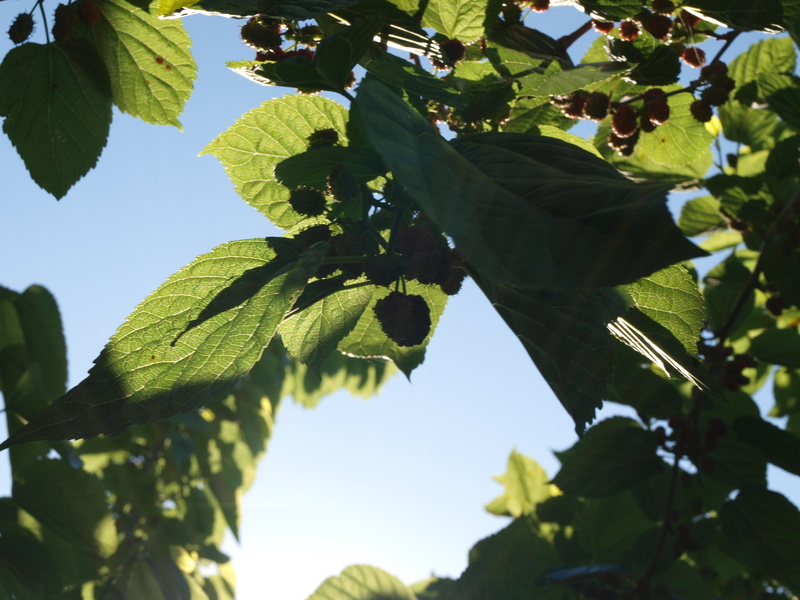 Earlier in the week I showed you how I’ve turned our mountain of mulberries into Jelly. After making the Jelly I was left with cups of pulp. Not wanting to waste it I started searching online for a recipe. I found my perfect recipe here. Just the right amount of sweet with a good kick of spice and a hint of lemon. I didn’t use alcohol in my recipe as I didn’t have any and no one (the hubby) wanted to go for a drive to buy any. Luckily for him it tastes just perfect though! 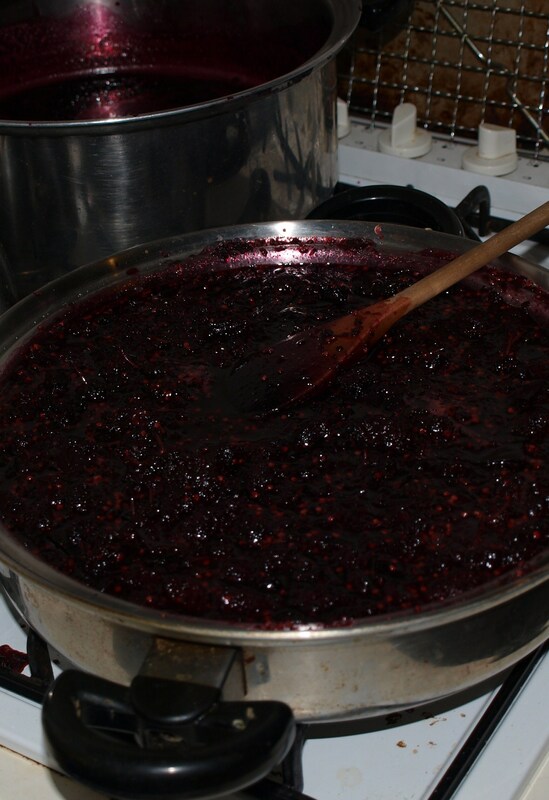 Now if you had patience (which I don’t) you will have snipped off all the little green ends before you made your jelly. But again I cannot be bothered, seriously 5kg of fruit harvested today, so I find I have to blend/ food process the pulp just abit. The stems are very tough! To make my pie filling I place the pulp, sugar, lemon and enough water (remember it’s been strained dry) to make it wet – apart from the water my measurement are as per David and Dawns recipe. Once it has come to a boil I add the cornflour to make a thick sauce. Since it’s already cooked, the filling only takes 10 – 15 minutes. Now you can make pies, turnovers, crumbles and tarts. I’ve also been freezing and preserving it in my vacola kit. To date 4 Vacola bottles and 20 ziplock bags full of filling. Oh my I think we will turn purple! I hope you’ve enjoyed these recipes and if you have a good recipe, or know of one online please send it through! Now I am off to make some more (MORE!) Filling. 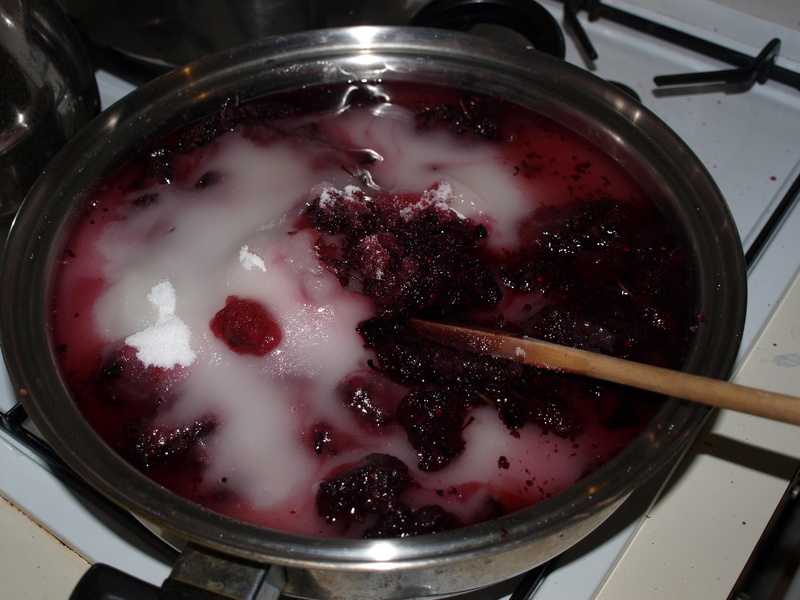 This is an oh-so easy Jelly to make, with (to date) rave reviews! In the beginning you will need to split the fruit and the liquid. This is done by cooking the fruit until it’s soft. 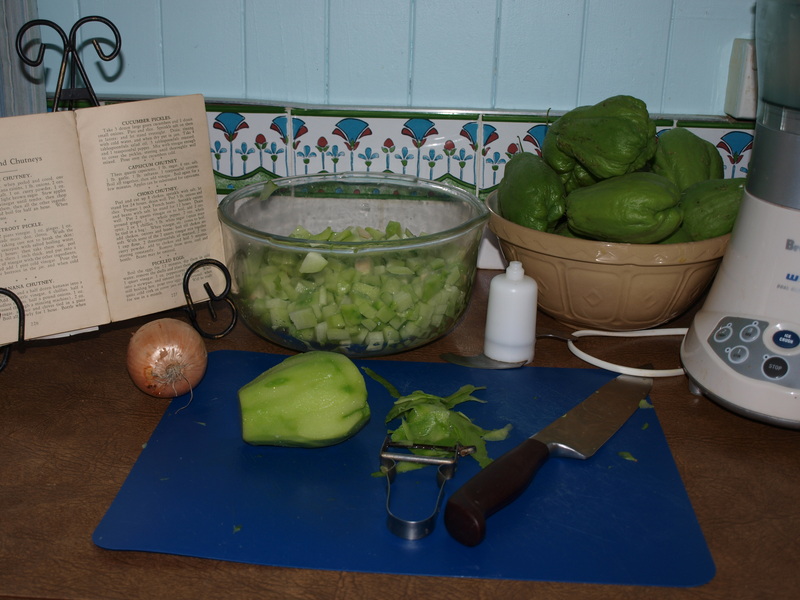 Just remember to wear an apron, have a cloth to wipe up spills and to use glass or metal bowls and pots…. Everything will become purple! Now place the pot on a med/ high heat and bring to the boil. 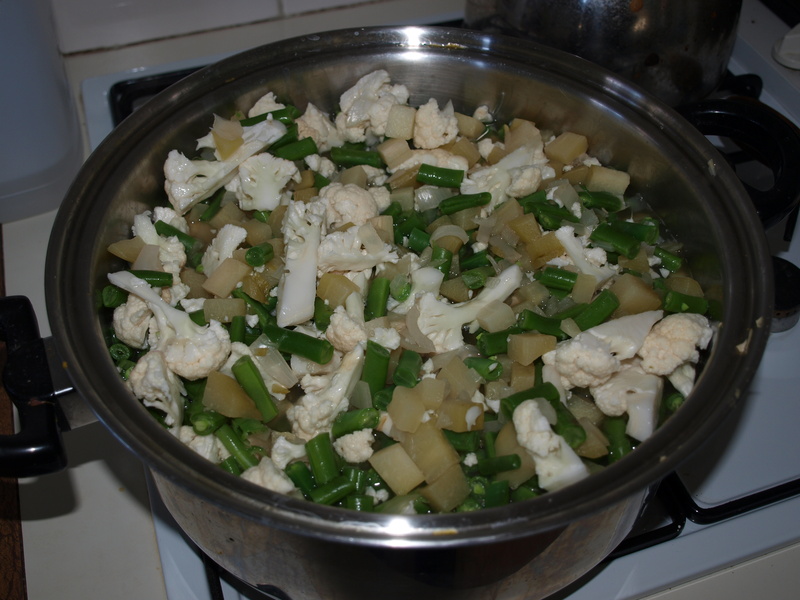 Once boiling turn it down to a simmer and remember to stir often. You may need to add a bit more water if the liquid gets low. When the apple is looking soft, it is time to carefully mash the fruit to release even more liquid – be careful!!! Once it is all mashed, let it cook for 5-10 minutes longer and then turn it off. 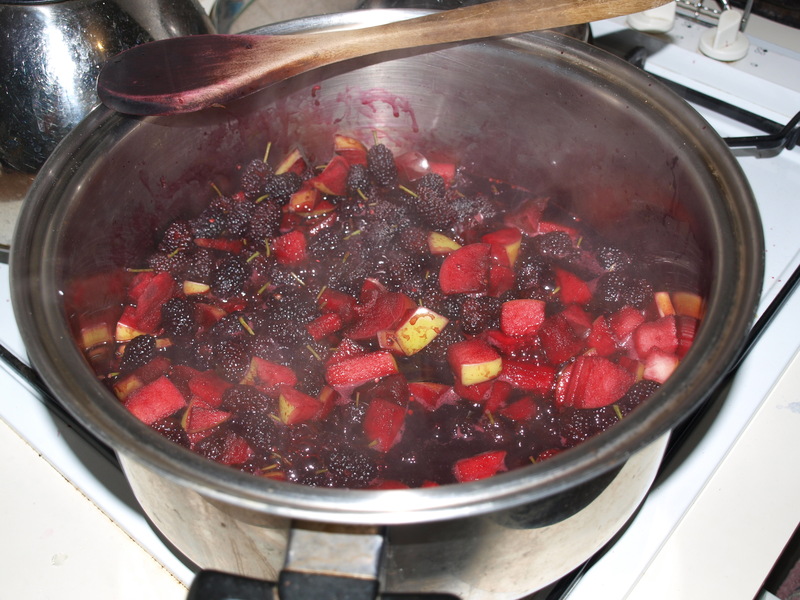 The fruit now needs to cool enough to safely handle the pot for straining. Normally in Jelly, the fruit would be put through a Jelly bag, but again I cannot be bothered. I’ve found a simple fine strainer does the trick. 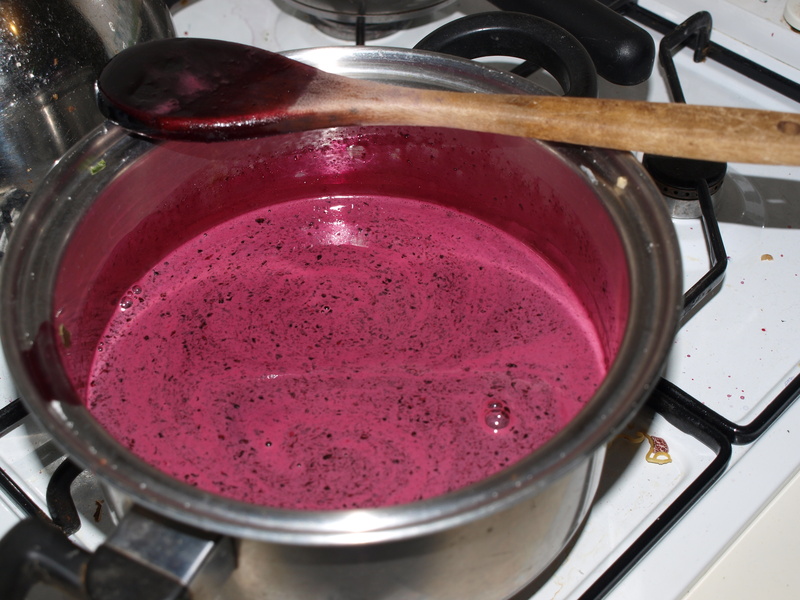 Strain the fruit and syrup-liquid into a big glass bowl. Let it stand for 30 minutes to be sure all the syrup is out of the fruit. The fruit can now be covered and put in the fridge. Method: Begin by measuring the syrup liquid, for each cup of syrup a cup of sugar is needed. Place these both into the pot. Bring to a boil and then reduce to a fast simmer. Next add the lemon juice, roughly a big tablespoon per cup. Simmer the juice for 20 minutes, again stirring often. After 15 minutes begin checking for setting point. This is done by placing a spoon full of syrup onto a chilled plate. The plate is then returned to the freezer for a minute. After a minute take it out and run you finger through the syrup. It is ready if a wrinkle forms on the skin of the syrup. Reaching setting point can take up to 40 minutes, but its a fine line between setting point and burning. Check for setting point every 5 minutes. 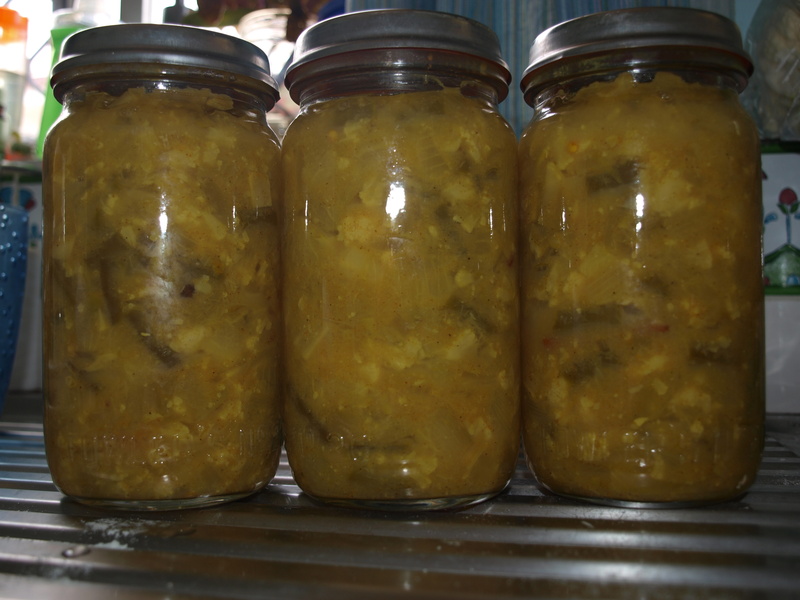 Once setting points reached, turn off the heat and ladle into hot sterilized jars. Seal and label. The Jelly once cool, will set to a slightly runny gel. But oh so delicious on toast, scones and pikelets! 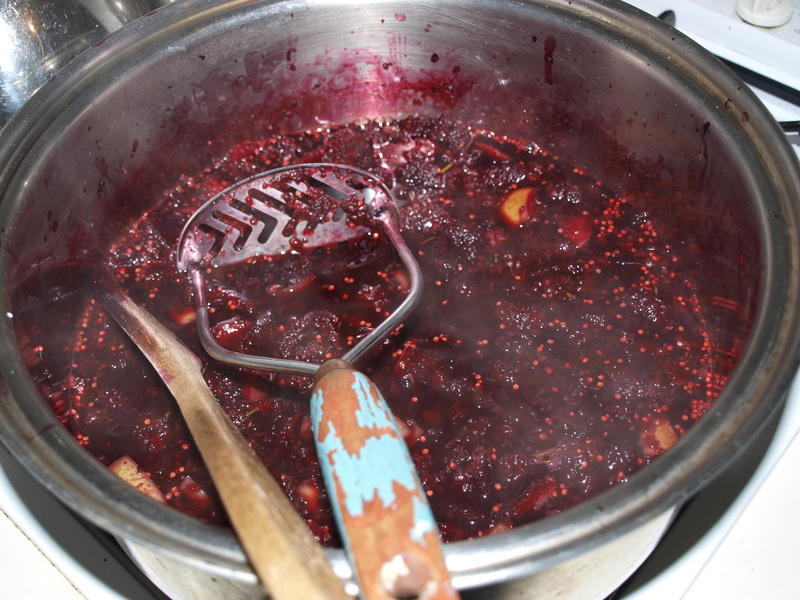 Tune in on Wednesday to find out how to turn your Mulberrry Pulp into a yummy pie filling! I cannot help but become childishly excited when I see the tiny mulberry flowers forming at the start of spring. A hint of the bounty that’s to come. A bounty were certainly getting this year. To date the harvesting total stands at 15kg! That’s a lot of tiny sparkling balls of goodness. (That’s not counting the many many handfuls eaten by the children, husbands and visitors!) 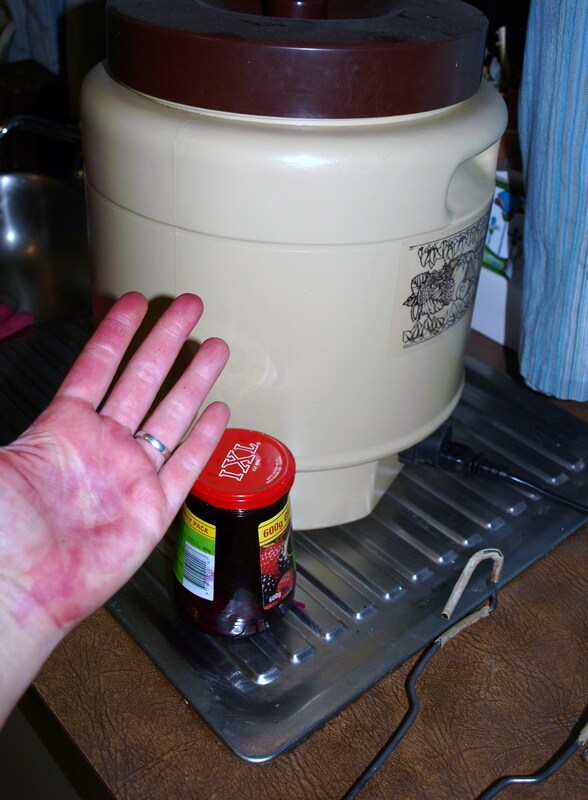 I guess you’re wondering what would one do with 15 kg of purple? 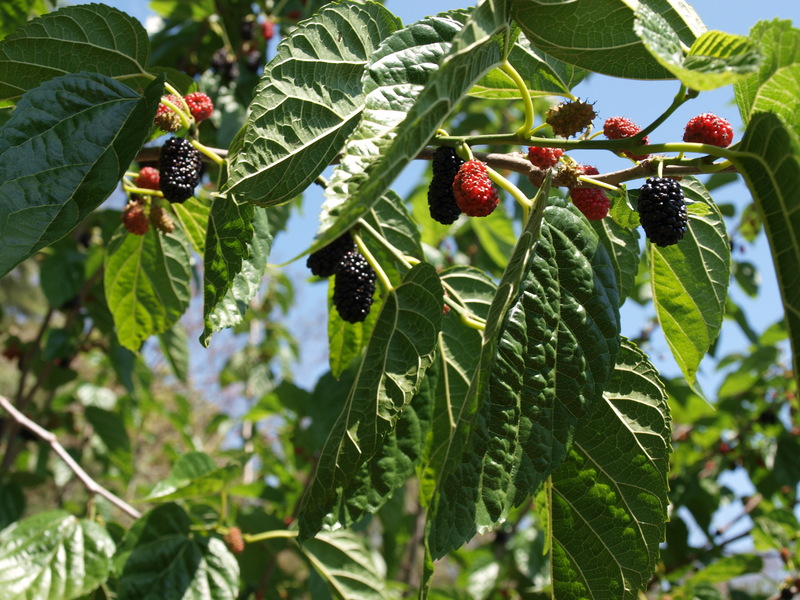 Mulberry Jelly, Whole frozen Mulberries, Mulberry Muffins, Mulberry cakes, Mulberry Crumble and Mulberry Pie Filling – just to name a few. Kicking around in the back pantry since, oh autumn. Five little loofahs have waited my attention. 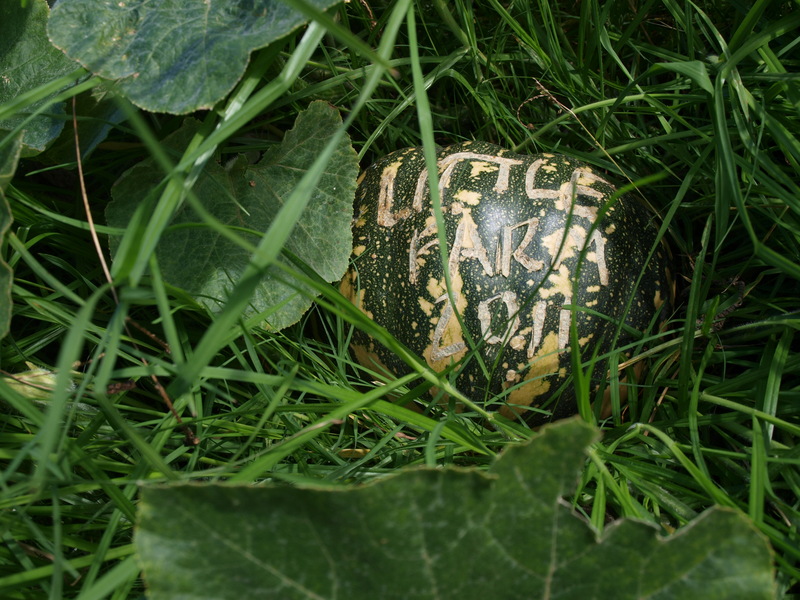 Forgotten by me until I was looking for the seeds. 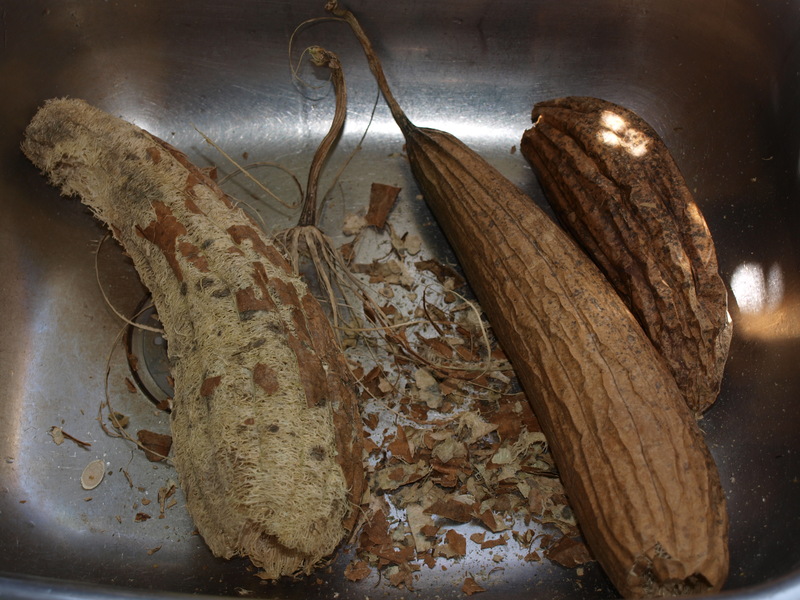 here is a quick rundown of preparing loofahs for use. Seriously so easy! Tip out, shake out or just get out as many seeds as you can. 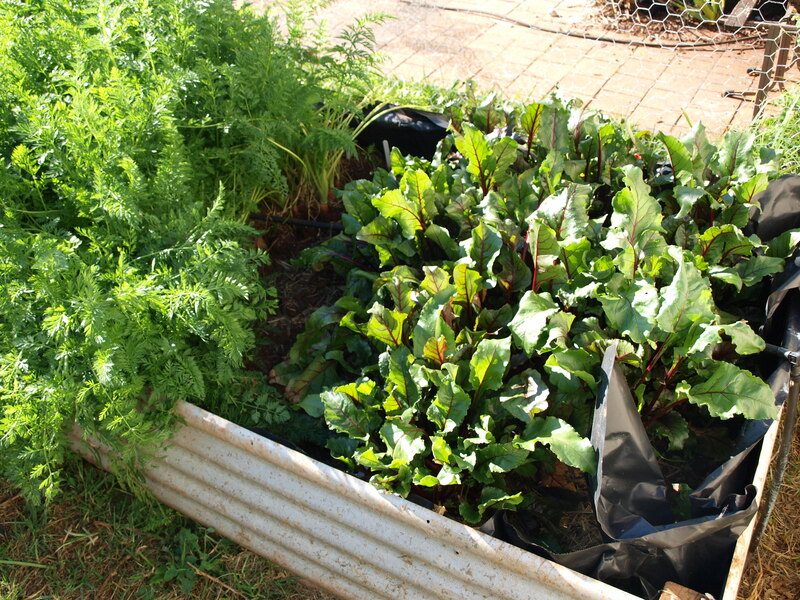 These are the ones that are replanted next spring. Peel off as much dry skin as you can without damaging the inside. 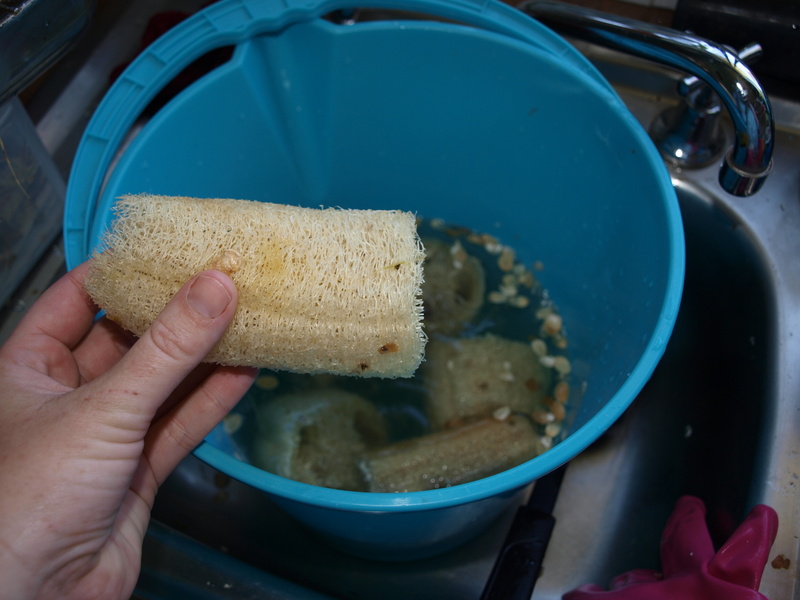 Soak the loofah in warm water for a few minutes, then peel off the remaining skin. Now they need to be soaked in a weak bleach solution – Bleach is dangerous please be careful! Your loofah is now ready to use! What can you do with them? Use them to clean your dishes or in the bath. And the best bit? They’re compostable when they become ratty! Now, would you like to grow a loofah? I have some seeds, ok I have a fair few seeds to GIVEAWAY! 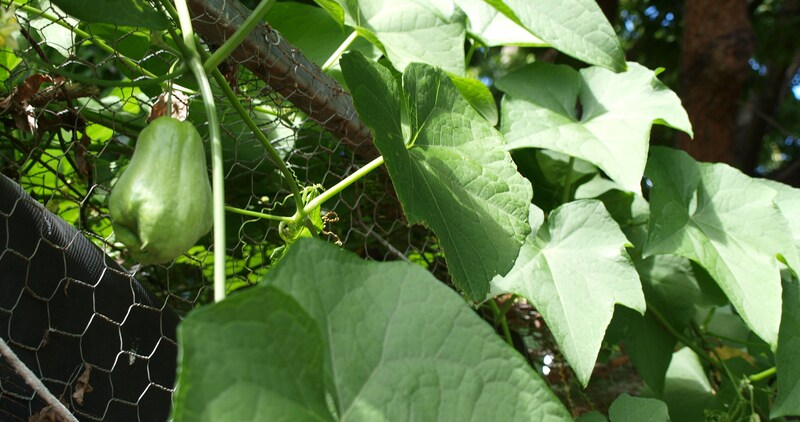 So if you would like to try a loofah plant this spring, drop me an email at littlefarminthecity at hotmail dot com – HAPPY GARDENING! 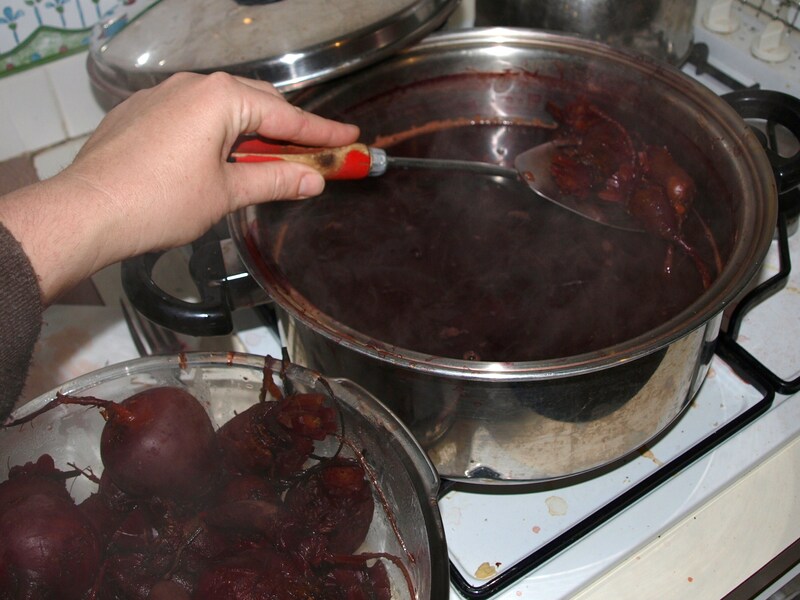 Begin by boiling the beets in water until soft. I had such different sizes, I added them biggest to smallest over a 15minute period. Once cooked, drain them and dump them into a sink of icy cold water. You need to chill them enough to handle. When cooled its time to peel off the skins, this is really easy the flesh kinda pops out. 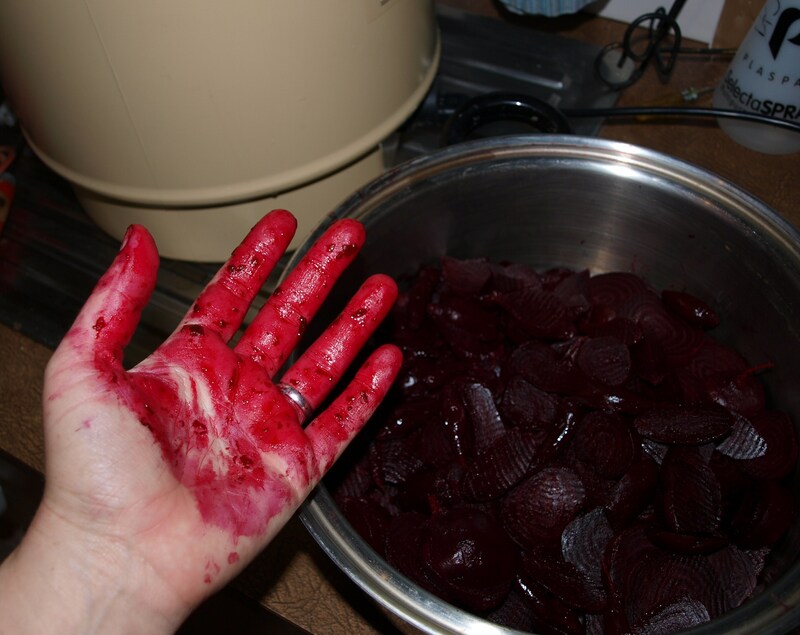 Next the now naked beetroot need to be sliced. Heres a hint – wear a glove and old clothes. Roughly 3 to 5mm is a good size. Place them into a big pot or bowl. In another pan or a really big pot heat the cider vinegar, honey and spice mixture to boiling. 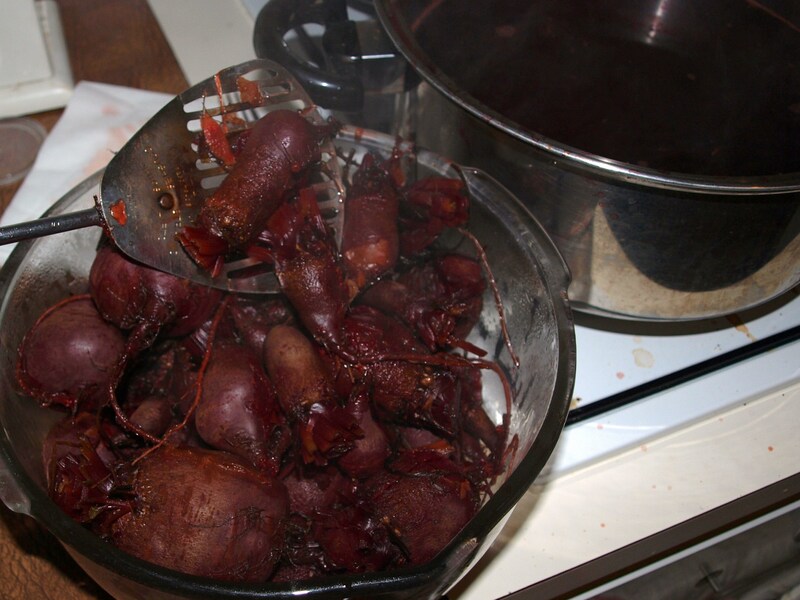 (I’m not sure of copyright if I can post the exact recipe here) Once boiling add the beets and return to a simmer. 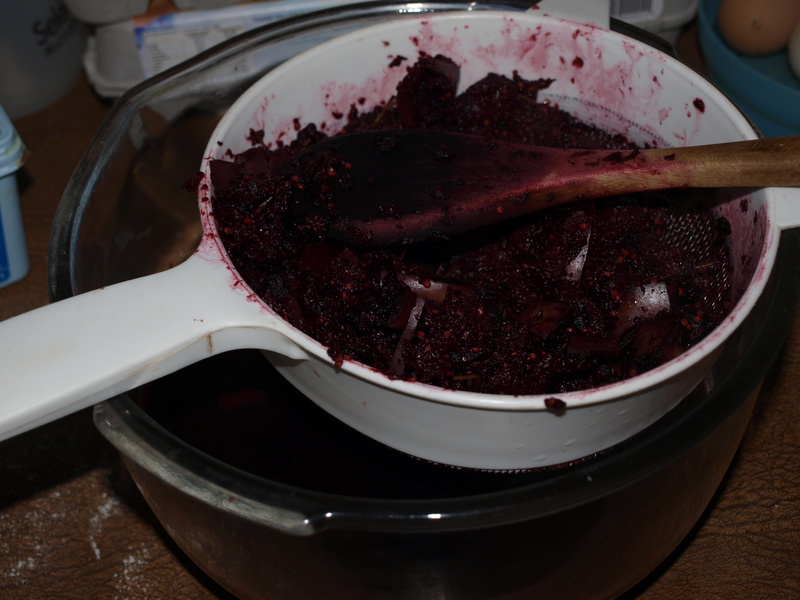 Working quickly add the hot beets to hot jars (I sterilized them in the fowlers kit) top up with liquid and cap. 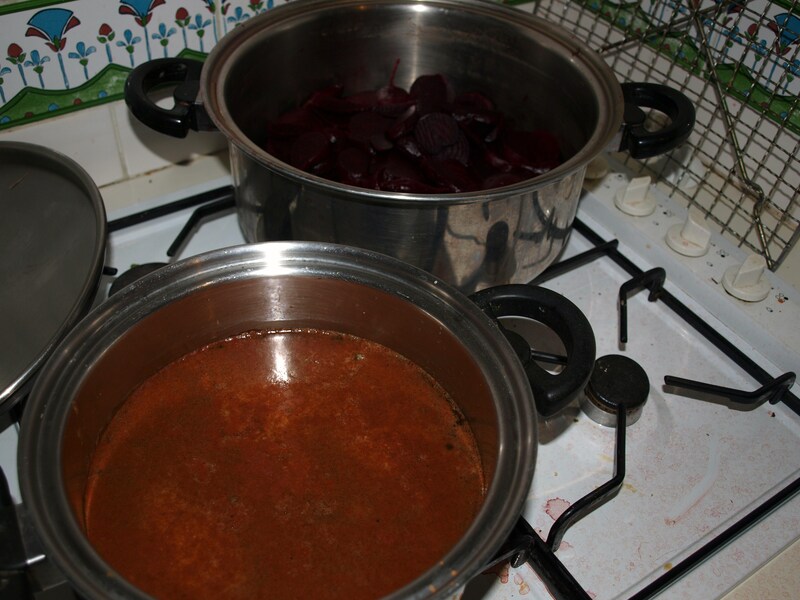 I boiled them for 30 minutes as the water was already boiling and the beetroot were hot too. In total : 2 bottles of fowlers no.20 and 1 no.31 with just enough extra to fill this jam jar too. And seriously wear a glove, don’t wear white and be ready for a purple splattering on everything! Taste test: Still a strong vinegar taste, need to sit for another week or two. But the sugar to acid is just perfect. It wasn’t that long ago I was wondering if we would harvest any of these beauties before the cooler weather set in. Well worry I needn’t! 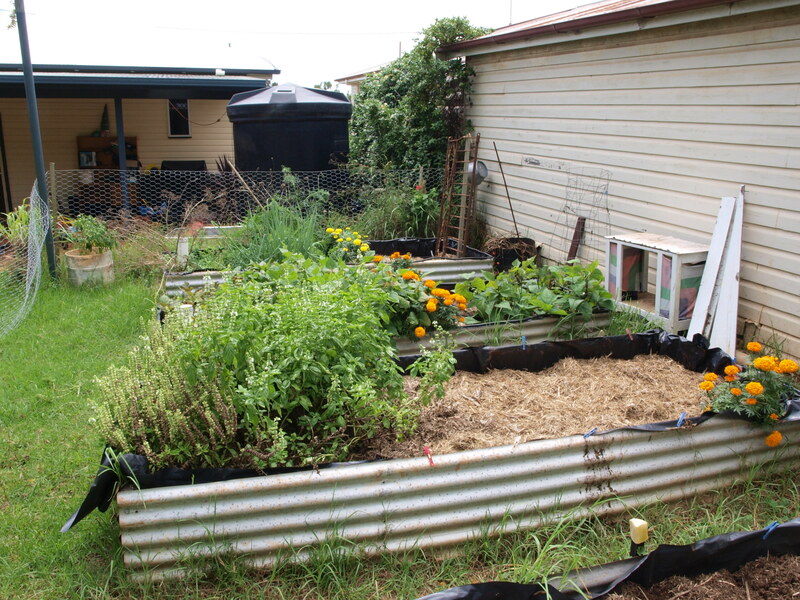 The vine has taken off and engulfed the Chook Pen and now we are feasting on the watery green fruits. Can you see the tiny one in the above photo? The fruits start about 1cm long. And I swear grow massive overnight! These were not here last night! Today I have 5 sitting on the table beside me waiting to be turned into a choko chutney. Oh yum! As always in my garden the Eggplants are the slowest to grow. The tomatoes have come and are just about finishing but not the eggplants, who finally start producing their purple bounty! 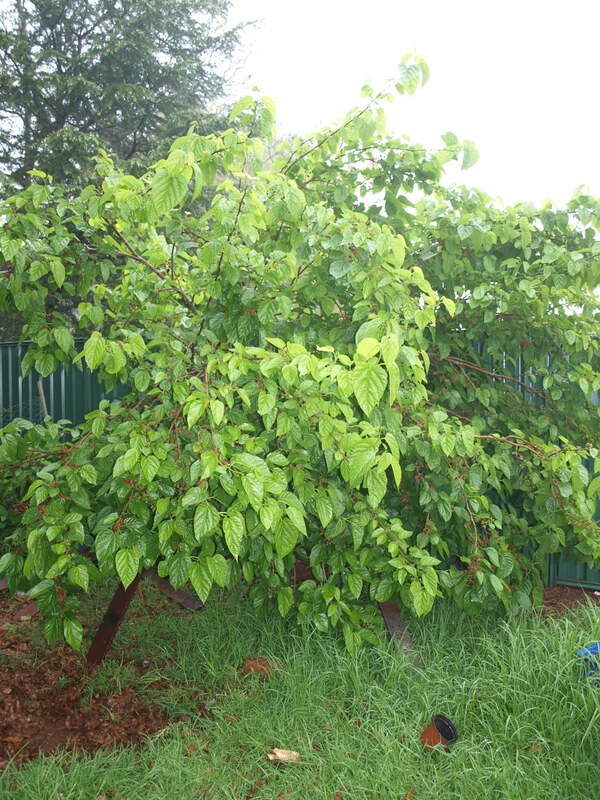 This years plant is producing a massive amount of fruit! More than we can eat. Our favourite eggplant dish here at Little Farm? Eggplants sliced and roasted in the oven, served with basil, ricotta and oven roasted tomatoes. Oh Yum! Once I have roasted the eggplant slices, I stored them in the freezer in serving size portions. There waiting to be enjoyed for months….. This year I have more than enough fruit to satisfy our eggplant cravings, enough that I am looking at recipes for eggplant relish. 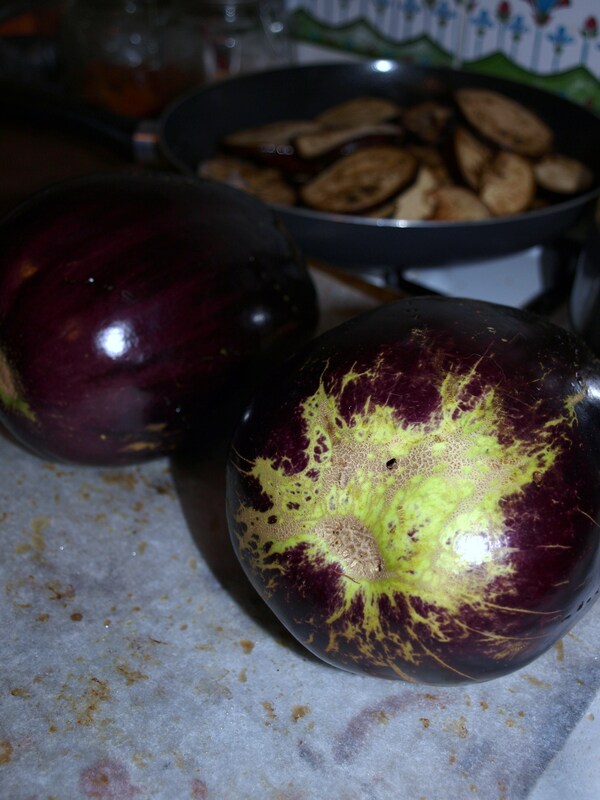 What is your favourite dish with Eggplants?